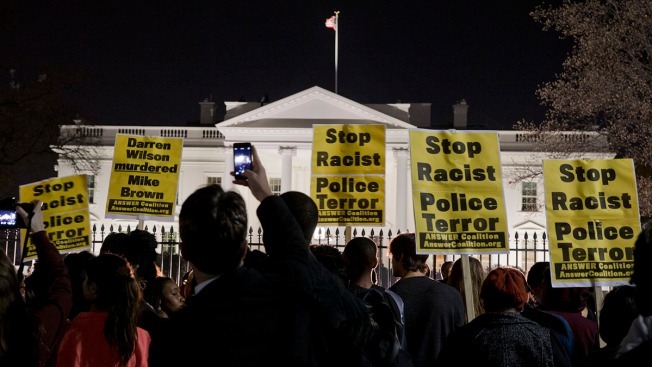 About 300 people protested at the White House after the decision not to indict Officer Darren Wilson in the fatal shooting of unarmed teenager Michael Brown in Ferguson, Missouri, U.S. Park Police estimated. 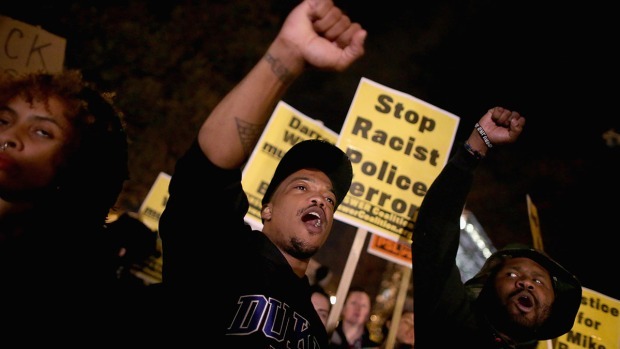 Protesters, many wearing sweatshirts of D.C. universities, chanted, "Black lives matter!" Some used megaphones to deliver speeches, but it remained peaceful, News4's Jackie Bensen reported. The Secret Service turned on floodlights on the Pennsylvania Avenue side of the White House, Bensen reported. Two or three dozen Secret Service and some D.C. police monitored the demonstration, but authorities took the position of allowing protesters to say what they wanted for as long as they wanted, Bensen reported. The crowd began to disperse before midnight. Some demonstrators closed U Street in northwest D.C. before marching to the White House, News4's Shomari Stone reported. They held their hands up in the air to demonstrate their belief Brown's hands were up when he was shot. Police rerouted traffic around the march. Police reported instances of looting, bottles thrown at officers and shots fired in Ferguson following the announcement. A police car was set on fire, and St. Louis County police said they were sending out tactical units and deploying smoke to break up unruly crowds, NBC News reported. 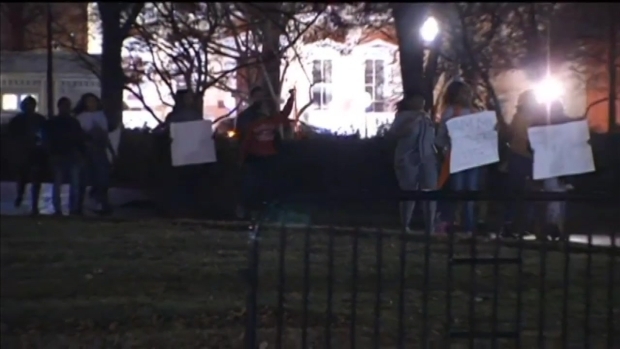 RAW VIDEO: Protesters arrive at the White House. In the wake of Brown's death Aug. 9, protests rocked the streets of the small St. Louis suburb. As a pre-emptive measure, Missouri Gov. Jay Nixon last week declared a state of emergency in advance of the grand jury's ruling, and activated the National Guard. 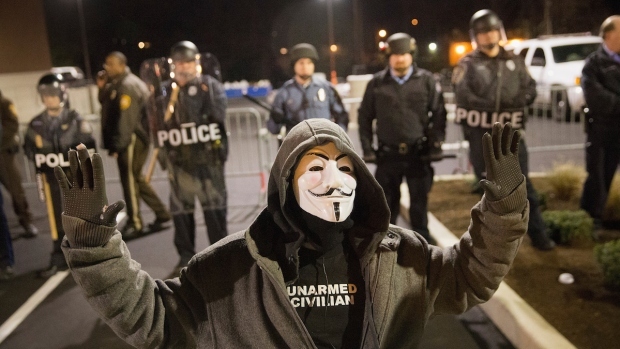 Protests erupted in several cities nationwide following the grand jury announcement. In D.C., the Washington chapter of the National Black United Front and several other groups had planned a protest in Mount Vernon Square for 7 p.m. Tuesday. In downtown Baltimore, the Baltimore People's Power Assembly was said to be planning an "emergency response protest" in McKeldin Square for either the day of the grand jury's decision or the day after. The demonstrations were planned both in protest of Brown's shooting and of other officer-involved shootings of Hispanic and African-American people. Earlier this summer, even as protests turned violent in Missouri, thousands of protesters gathered peacefully on D.C. streets in Brown's memory. A moment of silence and vigil were held Aug. 14 at Meridian Hill/Malcolm X Park, where almost every protester carried a sign calling for an end to police brutality. The group chanted, "Hands up, don't shoot!" Later in the evening, they moved downtown, setting up another demonstration on the steps of the National Portrait Gallery.